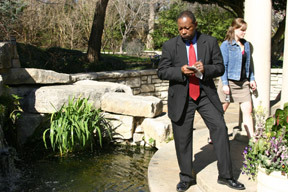 See the web archives of 2008 Meetings or 2007 Meetings or earlier HSA Meeting Archives. In 2008, the first HSA Quarterly Meeting will be held in Fort Worth, TX. The other quarterly meeting dates and locations are to be announced. 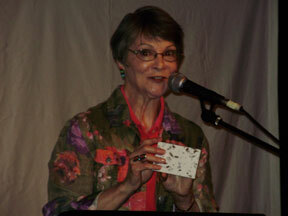 Listen to Haiku Northwest, featured on the KSER radio poetry show hosted by PoetsWest. To listen, tune your radio to 90.7 FM in the Seattle area, or listen online by visiting http://www.kser.org/ (click Listen Live). You may need to install plug-in software to listen online, so allow extra time before the broadcast to do that. (l to r): Ida Freilinger, Michael L Evans, Deborah P Kolodji, Terran Campbell, Michael Dylan Welch, Angela Terry, Marilyn Sandall, Karma Tenzing Wangchuk, Christopher Herold. 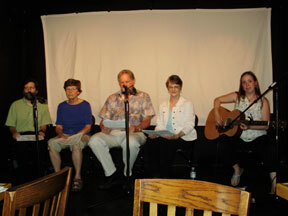 Curtis Manley, Marilyn Sandall, William Scott Galasso, and Connie Hutchison read a selection of Haiku Northwest member haiku accompanied by Dejah Légar on guitar. At the Boom Noodle, tt was great to see Tenzing, Michael Dylan Welch, and Johnye Strickland again. 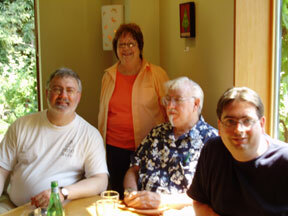 I also met Lenard D. Moore, Alice Frampton and Christopher Herold for the first time. From Boom Noodle, we all walked over to the Hugo House, where Michael Dylan Welch had planned a wonderful program, starting off with a read-around of haiku. One very cool idea for a local haiku group is that Haiku Northwest has scripted out a haiku/music performance that they can do on a moment’s notice when someone requests a haiku reading/presentation. 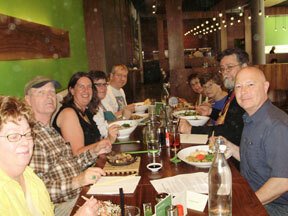 I think it would be great to do something like that here with the Southern California Haiku Study Group. Haiku Northwest members have scripted two different shows. They performed “Music and Sound.” Curtis Manley, Marilyn Sandall, William Scott Galasso, and Connie Hutchison read a selection of Haiku Northwest member haiku accompanied by Dejah Légar on guitar. Returning to the Hugo House, there was another round of open-mike haiku. Tenzing read a haiku from his Southern California Haiku Study Group days in my honor. Then, Ce Rosenow presented a paper on the senryu tradition in America. Senryu is one of those things that haiku poets like to argue about. Is it haiku? Is it senryu? Everyone has their own definition. Ce did an admirable job of addressing the essence of senryu, and how it fits in our society without getting overly bogged down in the “definition.” She framed her discussion by noting what she considers the two distinguishing characteristics of senryu – (1) that it occurs in a difficult cultural moment and (2) that it involves the everyday practices of human activities. She also spoke of the idea of writing about things “vicariously experienced through television,” which seems to be more acceptable for senryu than haiku. It was a very interesting paper that I hope she publishes someday soon. After another break where I both bought and sold books, Michael Dylan Welch spoke on “Cracking You Open: The Joy of Haiku.” Here he quoted Jane Yolen, among others, while talking about the sheer joy of writing. He posited that every haiku essentially says the same thing – “it’s great to be alive.” Although I admit to reading some very moving “sad” haiku about death and other difficult topics, I agree with his underlining theme about adopting an open, child-like wonder in order to allow the haiku come through. The last presentation of the day was by Ruth Yarrow on “Emotion in a Moment: Painting Watercolors and Writing Haiku.” In this, Ruth compared her painting experiences with her writing experiences, coming up with ten things to consider when writing haiku, showing paintings which showed those concepts. The ten items were simplify, lighten, contrast, reverberate, deepen, balance, grow, experience, share, and challenge. On Sunday, we had a ginko walk and kukai at the Seattle Japanese Garden, which is located in the Washington Park Arboretum. At the entrance was a haiku display with sample poems from Northwest Haiku members in addition to visiting haiku poets who were there for the HSA meeting. It was fun to see one of my haiku displayed so far from home. After strolling through garden tranquility, we met at the viewing platform where Michael Dylan Welch explained the writing exercise we were going to do on our ginko walk. We were to write haiku on the theme of sound. For more information, please contact Michael Dylan Welch at welchm@aol.com. Tenri Cultural Center, 43A West 13th Street (between 5th and 6th Avenues). This year marks the 40th Anniversary of the founding of The Haiku Society of America by Leroy Kanterman and Harold G. Hender-son. In honor of this occasion, three of the four Quarterly Meetings have included readings from past issues of Frogpond. At the New York City meeting in September, Leroy Kan-terman was introduced as one of the founders. 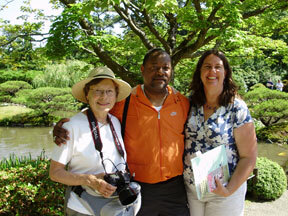 Those present expressed their appreciation to him for his efforts on behalf of haiku poets in North America. President Moore announced that the commissioned Fortieth Anniversary Anthology reprint of the winning poems of the Brady and Henderson Awards would not be available, as previously announced, before the end of the year. 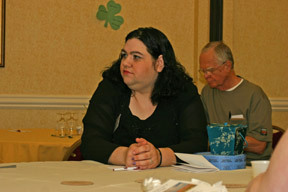 Roberta Beary, who with Ellen Compton edited dandelion clocks, the 2008 Members’Anthology, reported that the pre-ordered copies had been mailed, and that additional copies were available for purchase at the meeting. The Society received two letters from the British Haiku Society, along with a poem by Doreen King of the BHS which was read aloud by Roberta Beary. Under Other Business, Johnye Strickland explained that the Executive Committee was discussing the problem of having Quarterly Meetings. President Moore was having difficulty finding hosts for two of the 2009 meetings, and rising transportation costs as well as the general state of the economy are deterring even EC members from attending four meetings a year. A suggestion was made that we reduce the number of meetings, but Johnye pointed out that the By-laws require four, and that any attempt to revise the By-laws is usually met with little support. Attorney Roberta Beary suggested that it was not necessary to amend the By-laws in order to change the number of meetings for the coming year. We could vote to suspend the rule for the year, and remain legal. Being thus enlightened, Johnye made a motion to suspend the requirement for 2009, and just have two meetings. The motion was seconded by Tom Heffernan, and passed unanimously. President Moore presented gift boxes of Mount Olive Pickles to Bob Moyer and Dave Russo for their work in helping organize the Winter Quarterly Meeting of HSA in Winston-Salem. The Business Meeting con- cluded with a memorial reading of poems by, and for, the renowned poet, scholar, teacher and friend, William J. Higginson, whose death occurred October 11, 2008.